It was mid-morning when the Habitat for Humanity Vietnam team approached. The sun was making its ascent, warming the day in the Quang Nam province in central Vietnam. 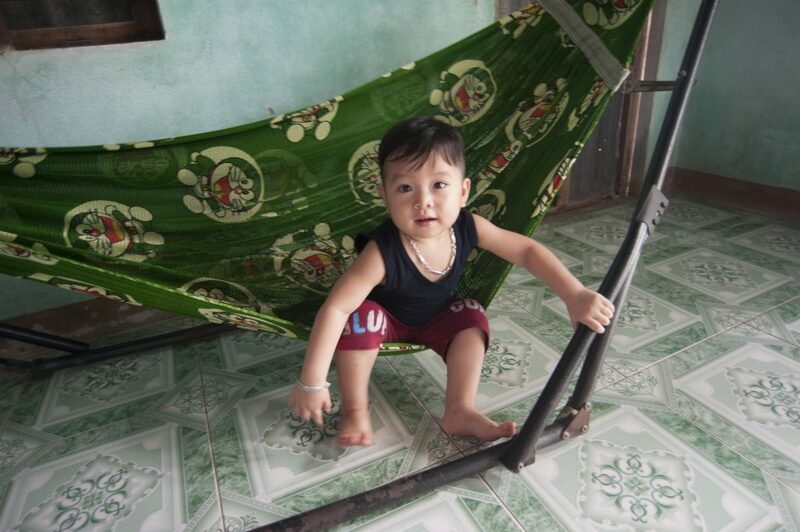 Phạm Đặng Anh Khoa, a two-year-old boy, was resting in the green hammock in his family’s living room. Upon hearing the Habitat for Humanity Vietnam team’s footsteps, Khoa curiously poked up his head to see who was visiting. Observant, he noticed the camera in the hands of the HFHV photographer and eagerly wiggled out of his hammock to the home’s front steps. 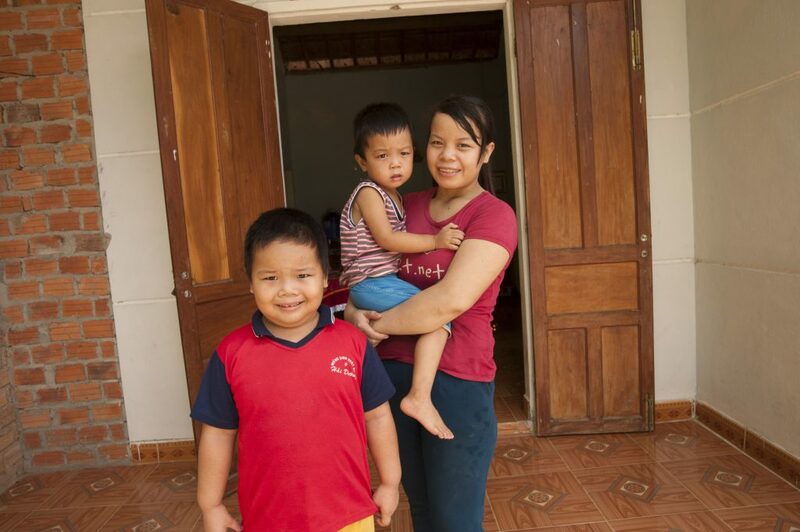 Much to the Habitat for Humanity team’s surprise, Khoa began to smile and unabashedly pose, waiting for his picture to be taken as though the home’s steps were a stage. A spontaneous photo-shoot of the vivacious toddler ensued amidst laughs of delight from the Habitat for Humanity team. Khoa’s grandmother, Nguyễn Thị Được (56) watched the interaction, softly smiling as her grandson welcomed the HFHV team. Được works as both a recycler and a rice farmer. With her recycling job, she gathers reusable materials to sell for income. Her son and daughter-in-law, Phạm Kỹ Lực (27) and Đặng Thị Kim Lành (22), are both hired workers but their monthly income varies. Sometimes the young couple saves enough money to give to the aging grandmother to cover monthly expenses but the couple’s income is dependent upon the amount of work available for the month. 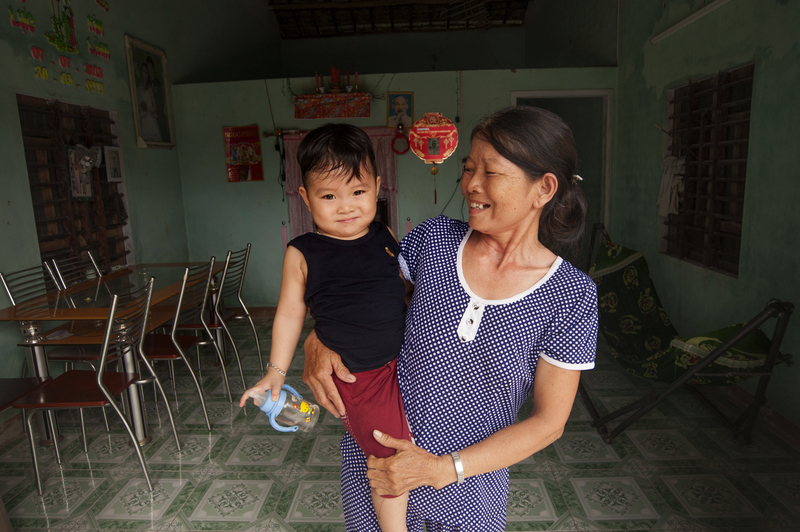 In 2012, Được was selected by Habitat for Humanity Vietnam for a loan of 15 million Vietnamese dong (roughly $670 USD) to build a new toilet in the home. Before the toilet was built, Được said that life was difficult. The family had to go to the nearby mountain to use the bathroom. Furthermore, Được stated, “My son told me that he would only get married if we had a toilet. Now he’s married and I have a lovely grandson, nothing can make me happier. Thank you HFHV!” Được later joked that even Khoa can now get happily married. 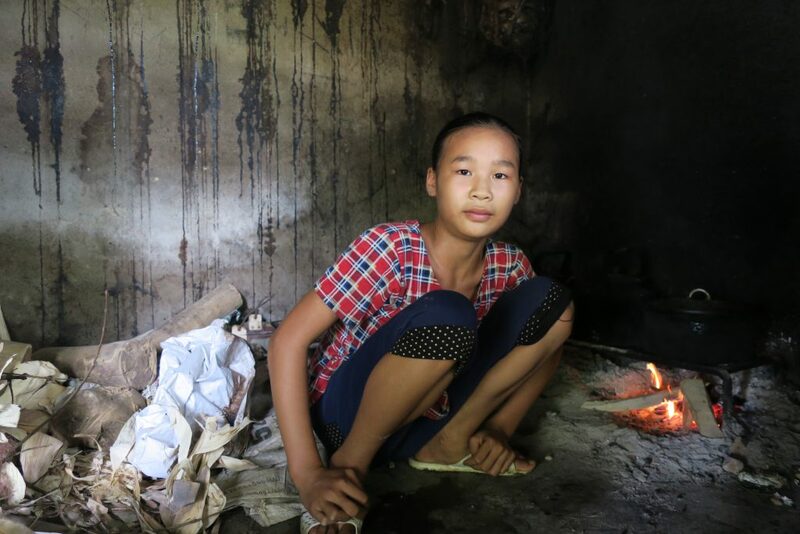 In 2015, three years after the toilet was completed, Được and her family successfully paid back the original loan and were granted a second loan of 20 million Vietnamese dong (roughly $900 USD) for a new kitchen. The old kitchen was rickety and built from wooden bamboo poles and leaves, which became wet when it rained. The new kitchen, however, is spacious and remains dry during rain storms and cool from the heat during the summer. The Habitat for Humanity Vietnam team spoke with Được in the new kitchen as she filled Khoa’s bottle with water. Khoa had expended his energy entertaining the Habitat for Humanity team and he was thirsty. Outside the kitchen door, Khoa’s colorful Spiderman tricycle and tiny Spiderman sandals sat waiting for him to continue playing. To the family, both the toilet and the kitchen were more than just components of their house; they were the foundations from which the family grew. Young Khoa is evidence of that.